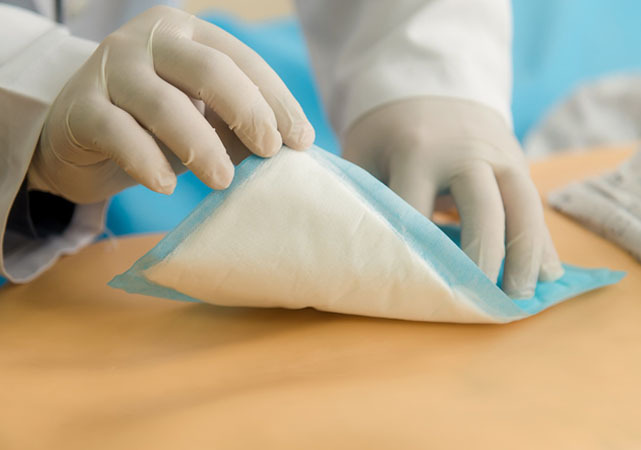 Post-operative and transparent film dressings don’t just make work easier for healthcare providers dealing with wound-afflicted patients, they in fact save lives by preventing a number of potentially fatal problems and by making many proactive wound care strategies possible. These products are water, miscellaneous liquids, and bacterial colonies impermeable, while at the same time being permeable to atmospheric gases and moisture vapor. In best case scenarios, as a matter of fact, you want bio-occlusive dressings that allow oxygen (needed by fibrocytes to help form new tissue) to get through while also letting excess exudates or fluids to keep draining properly. They can help keep a close eye on necrotic and marginally gangrenous tissue. During the Civil War gangrenous limbs were peremptorily removed, which is why so many of the men who fought in that war ended up permanently crippled. Today, however, many such injuries have better outcomes because of antibiotics, better-informed wound management protocols and the availability of high-quality, dependable and bio-efficient post-op and transparent film dressings from reputable sources (e.g., Pharmaplast). They can help spot problems and shortcomings with IV line connections. Two such potentially serious problems are catheter tip dislocation and blood continuously seeping into the catheter. Not addressed, either one of these problems (which are more likely to be spotted when using transparent dressings) can lead to serious medical repercussions. They can help healthcare providers assess whether 2nd or 3rd degree burns are healing appropriately. Burns are a very special type of wound. If they fail to heal at a reasonable pace (or don’t heal at all), then something may be afoot beyond the injury–maybe you’ve got an undiagnosed diabetic or maybe an infection is developing, especially if you have redness and too much fluid (or pus) building up. They can help induce healthy drainage by possessing unique hydrophilic qualities . . . some types of drainage are actually a good thing but it isn’t easy to naturally motivate the body to do so safely. You want a wound to stay moist from 25% to 75%–moisture exceeding that is probably in the realm of an infection. They can help provide a healing-assisting moist environment . . . dryness can hinder healing in many cases. The eschar (scab) that generally forms over a wound, the body’s lame way of protecting the area, may actually dry things out, which isn’t a good thing. The cells that repair damaged skin work best in a moist environment. Transparent film dressings can deliver all the benefits of surgical tape while at the same time providing bacterial, viral and waterproof barriers. The best brands of transparent film dressings have the unique quality of being able to dissipate shear and friction. Shear and friction are two types of motion dynamics forces which are often associated with pressure ulcers—most commonly found in bed-ridden patients. “Sheet burns” is one of the terms used to describe what friction (constant rubbing of skin against surfaces, like bed sheets) is responsible for inducing. Pressure ulcers are more than just discomforting and painful—they can be deadly if they lead to antibiotic-resistant infections or, in worst case scenarios, inflammation-induced cancerous neoplasms. Dressings that can’t conform to intricate human body parts or flex with the constant movement of patients tend to come off in potentially life-threatening ways by making infections more likely, dislodging catheter tips, etc. High quality dressings, though, obviate many of these problems. The best post-op and transparent film dressings offer superior application qualities such as by having picture frame borders, manageable stickiness, and a natural affinity for human skin. Although medical personnel may be familiar with some (if not all) of these life-preserving qualities, many people are probably unaware of how important high-quality post-op and transparent film dressings are in the healthcare theater. Their importance is easily tabulated in terms of cost-savings, less time spent treating wounds, and prevention/reduction of complications–more importantly, post-operative and transparent film dressings help save human lives by promoting and making possible proactive and strategically preventive wound care management.